That is the perfect kitty! Cute. Love the browns and pinks. Really nicely done. I love that he's holding the mustache on a stick with his tail. Great! How adorable!! Love it!! Perfect!! Adorable. FYI ~ Gwen's page didn't link to file. Adorable birthday card. Love it. Your inking on the cat is terrific. Great job. What an adorable little kitty. So cute. What a sweet Kitty card. I love it! Cute Kitty ! I love it. Love the kitty card. Sooo cute! Your little kitty is so cute! Great idea and terrific work. Your cat card is adorable. Love the sentiment. so cute...I love the adorable little kitty! Great project! Thank you so much. You're kitty is the cat's meow. I so love your shaped card and the Mustache Kitty is way too adorable. Candace this is fan-tache-tic! I love the face on the kitteh! So glad I got the mustache stamps last month! Happy Movemeber! Just love this kitty project. I LOVE your adorable photo booth kitty!!! What a cute way to add the mustache to your project. LOVE!!! aww sweet kitty!! So cute!! reminds me of the Aristocats! Cute and love the colors! 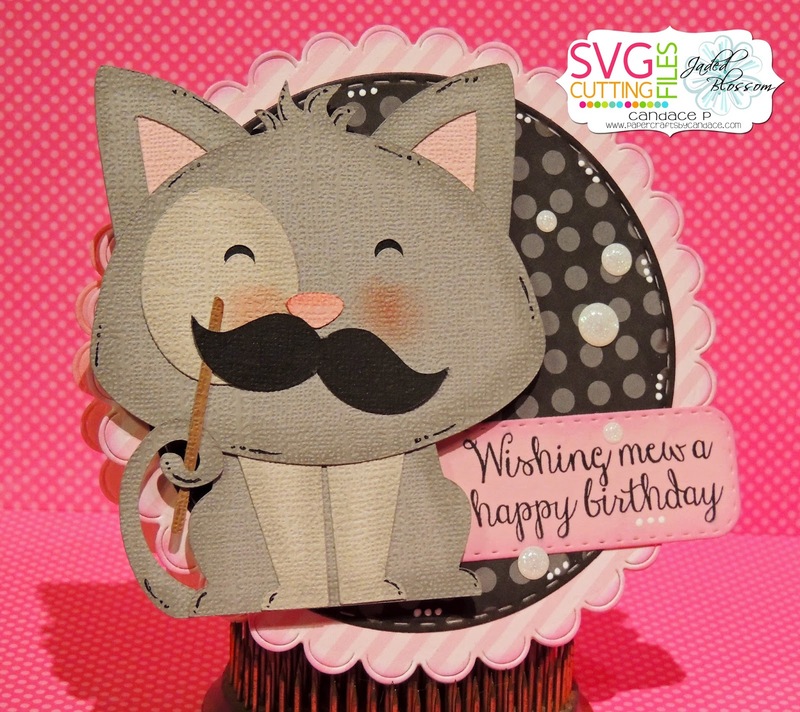 Very cool mustached cat card. Love the Kitty!!! Thanks for sharing! What a cute cat! Great job! Love the kitty! Too cute! Well isn't he a scholarly little fellow. Great project. omg...this is so flippin adorable!!!! Is that kitty holding a photo booth prop 'stache!! So cute!! What a unique idea! I love this kitty cat! Gotta get him meow! That kitty is super cute!! :) Great hop! Awesome way to end the hop. Great job! Thank you and everyone for another great hop. Love it every time! This kitty is so cute. TFS! Cute cat. Love the mustache! Very cute! Thanks for all of your hard work! Cute kitty works great with that card base.